I must admit that I am a huge fan of the Marvel Secret Wars toys made by Mattel. These were the 1st Marvel action figures I ever had. They were actually my brothers' figures, but were passed down to me. Over the years I have managed to buy every figure, play set, and almost every vehicle from the line (including the European exclusive figures). 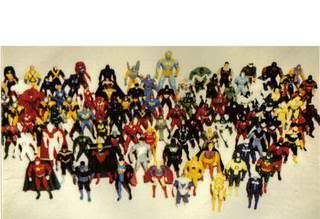 With companies like ReAction making figures that look like old school toys, I can't help but feel like it's time that someone makes "new" Secret Wars figures. I know Gentle Giant made those large scale ones that run about $100 a pop, but that isn't what I'm looking for. One thing that I really want to do is try taking the figures apart and making molds out of the pieces so I can cast my own parts. Seriously, if anyone has experience casting their own molds, I would happily supply all the needed parts and help pay for this. That's something that seems really cool. I can't keep buying figures just for parts when some of those figures get expensive. For instance, Falcon has a great head sculpt, but he's a more expensive figure to track down. So am I the only one on here who has love for these figures? Am I the only one who is making customs of them in 2018? If you remember this line, share some love. Thanks for reading all this too! Last edited by Spyne98; 03-20-2018 at 12:26 PM.. Doctor Doom was one of my first action figures and a favorite for years. I have a carded one up on my wall even today as a little reminder. Secret Wars was pretty much my gateway to everything Marvel, and they were fun figures and much sturdier than Super Powers, which I kept in a shoebox with all their broken arms and legs. I've dabbled with the idea of going back and collecting them again. What's the prize pieces from your collection? Is it the foreign figures or multi-packs or whatnot? Post some pics mang! I love Secret Wars, although I only own 3 figures. When I was a kid, I'd stop at the local toy shop on the way home from school and just stare at them. I loved Wolverine even though I had no idea who he was at the time. There was a kickstarter called Amazing Heroes that was inspired by the old Secret Wars figure design. They used the same body style to create various silver age, modern, and public domain characters. I love them and they look excellent beside their Secret Wars counterparts. Last edited by RolandofGilead; 03-20-2018 at 02:53 PM.. I still own the baron zemo my mom bought me as a little kid. I ended up finding a doctor doom and daredevil loose at a flea market. However my coveted figure that i owned BUT lost somewhere never to be found was the secret wars black costume spider-man figure. I've ebayed prices on them still on the card and everything. However i can just never justify pulling the trigger on one. I gotta post some pics. Since I moved, they are still in storage at my parents’ house. I have them well protected. But I really want to bring them to my apartment. I think my prize pieces are the European figures. Or the Freedom Copter. It took me a good long time to find it. I saw that kickstarter recently. I was wondering how they compare. The Black Spider-Man that I have is the only one I have ever seen in person. He’s a great figure! I had all of them plus did many customs from them. That was where I started customizing. I love my secret wars figures! I’ve got all the ones I had when I was a kid, plus a few customs. I really want to build a full loose set, and a MIP set. That was really a great line. Here is a tip: One of my first customs was a classic stealth Iron Man suit. Paint him black with a red chest piece. Loved SW, still have my silver claws wolverine packed away somewhere. One of the best toy lines of that time. Nice work kylactus! I'm planning on making a Cyclops, War Machine and Black Panther too!